Senior outfielder Austin Booker gave the No. 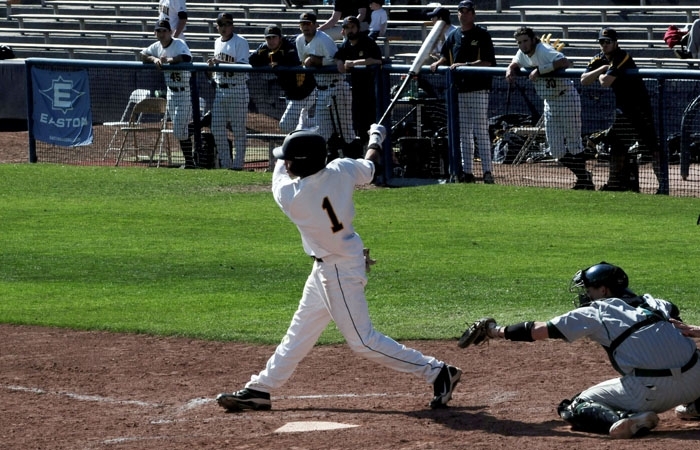 20 Cal baseball team its fifth walk-off win of the season with a double RBI in the ninth inning. Two days ago, the Cal baseball team couldn't scratch its way back from a 4-0 deficit, setting up Sunday's rubber match when it fell a hit or two short in a 4-3 loss to Oregon. "We were at a point in time where we weren't going to get that hit. It just wasn't gonna go our way," coach David Esquer said yesterday. "Today was, today was." It may have taken a few wild sequences, but a little bit of luck and a walk-off single by outfielder Austin Booker gave the No. 20 Bears a 5-4 win at Evans Diamond - and their first series win since sweeping Washington on April 17. Cal (26-14, 11-7 in the Pac-10) again gave up a 4-0 deficit - this time just two innings into the rubber match - and it took 6 2/3 innings of stellar relief pitching by senior Kevin Miller to gave the team a chance to work itself back to a win. The rest of the team backed him up at the plate. After going three up, three down the first three innings, nine different players notched hits to earn its fifth walk-off win of the year. "The dugout just turned. You heard guys talking about 'team at-bats,'" Esquer said. "Just keep the line rolling. Just add to what we're doing. No one guy has to do it." The work began with a stand-up double by junior outfielder Danny Oh, a hit which put the Bears in scoring position for the first time all day. Cal didn't squander it. Two at-bats later, first baseman Devon Rodriguez knocked a double of his own on full count into deep right center to put his team on the board. Third baseman Mitch Delfino then opened the seventh with a bunt single. The Bears followed with a single into the left field gap, and shortstop Marcus Semien's bunt single gave them runners on the corners. A groundout scored Delfino right after, and a shot past second by Austin Booker scored Semien to put Cal within one. A single by second baseman Tony Renda broke in the eighth. Catcher Chadd Krist then nailed a ball off the back of Oregon relief pitcher Christian Jones. A high throw sailed past first base, allowing Krist to reach second and Renda to score the tying run. The bullpen made sure Cal wouldn't need to muster up much more. Junior closer Matt Flemer turned a 1-6-3 double play in the top of the ninth, then kicked a low grounder that he tossed to first base to end the inning. Once the Bears came up to bat, they sealed the deal. Semien set up the drama with a double on the first pitch he saw. Then, on a 1-0 count, Booker lined a single into left field for the winning run. "I was just trying to see the first fastball I could get and smoke it somewhere," Booker said. The slow, chippy comeback overcame a disastrous start by Dixon Anderson, who entered the game with a 4-2 record and 3.71 ERA. The Ducks began battering the 6-foot-6 junior almost immediately; he surrendered a soft single through center on the second at-bat and allowed three more hits in the opening frame. He needed 41 pitches just to finish the inning, spotting Oregon (22-20, 5-10) a 3-0 lead. Anderson didn't fare any better in the next frame. The coaching staff pulled him after 14 more pitches and two hits. Miller, who was coming off a terrible eight-run performance of his own on Monday against Stanford, took the mound with runners on the corner. After the runner on third scored, he pitched shutout ball the rest of the way, striking out four looking and five total. "What a performance by Miller. Just outstanding," Esquer said. "He won the game." A previous version of this article incorrectly identified Oregon's reliever as Scott McGough instead of Christian Jones. Jones pitched in the eighth inning while McGough pitched the ninth. The Daily Californian regrets the error.